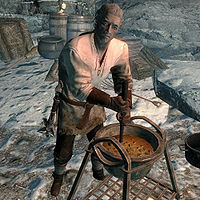 Angvid is a Nord warrior who is trying to make a living in Whistling Mine. However, due to the lack of ore of any kind in the mine, he is wondering if it is still worth it and is losing his faith in both Thorgar and the mine. He will sleep in one of the bedrolls near the entrance from 8am to 8pm. Once he is awake he will mine the few ore veins, cook, or sit at the table. He wears a standard miner's outfit and carries an iron mace, and a selection of lower-class items and gold. When approached, he makes the situation and his doubts quite clear by saying "We were supposed to be rich by now, you know. Thorgar insisted we'd be swimming in gold. ", "I'm starting to think we might not even find iron in here. We've been at it for so long." and "Is it still worth it? When do you decide enough is enough, and just walk away?" This page was last modified on 4 January 2018, at 07:09.